I bought an old 3060 on ebay. Unfortunately there was transport damage due to improper packaging. After an extensive service, it plays again wonderfully, the automatic works perfectly, I love it .. The tonearm is very good, the flutter is good, the rumble probably a bit stronger, but not audible to me because of the special bearing. Holds its own with the Dual 1218, in fact the adjustable cartridge is much better designed. The mechanics are more basic, allowing for a smooth automatic sequence. There is no distinguishable sound difference between this model and the Dual 12-- series tables. I found the table much easier to refurbish and work on. Perfect for a Sure M97E or better. 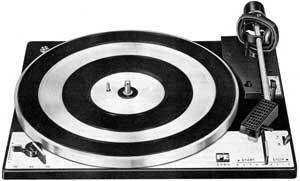 I think this is an excellent small footprint automatic turntable in the vein of the Dual 1218, but much rarer. High build quality precision mechanics will appeal to the collector as well. It sounds absolutely fantastic with a Shure M97xE with a JICO SAS stylus. 14.99 at Goodwill-really sounds better than my old Kenwood-more live.